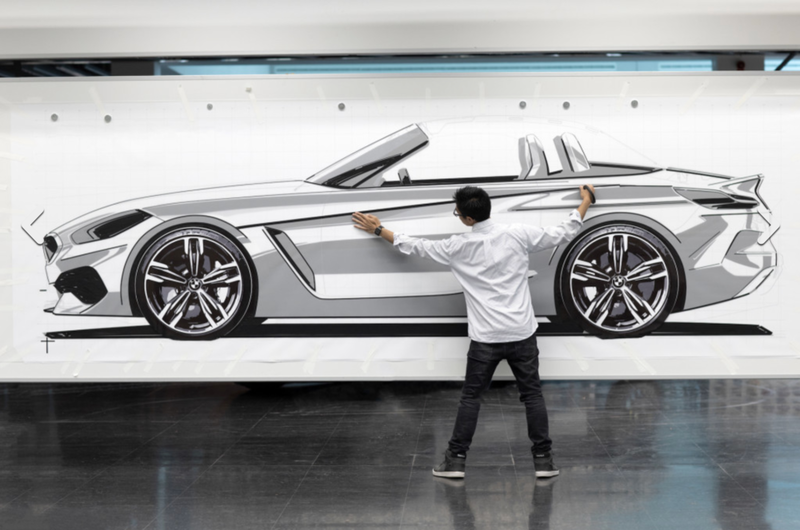 Whenever I see images of automotive designers thoughtfully shaping vehicle profiles at 1:1 scale on walls with tape and film and pen and pencil I get inspired. Regardless of how often these traditional visualization methods are used in this age of virtual reality visualization capability, images like this are a powerful reminder of what goes into getting vehicles out into the world. For the rare percentage of them that resemble rolling sculpture, it is well and good to be reminded of all the effort, craft, vision, methods and attention to detail that goes into making them a reality. Vehicle designer working scale drawing. Today's ride sharing services use vehicles that never designed with this form of mobility in mind. Designing for choice will be a key challenge for those creating vehicles optimized for ride and car sharing services in the years to come. Passengers may choose to work, converse, be entertained or just relax and restore themselves with some private time. 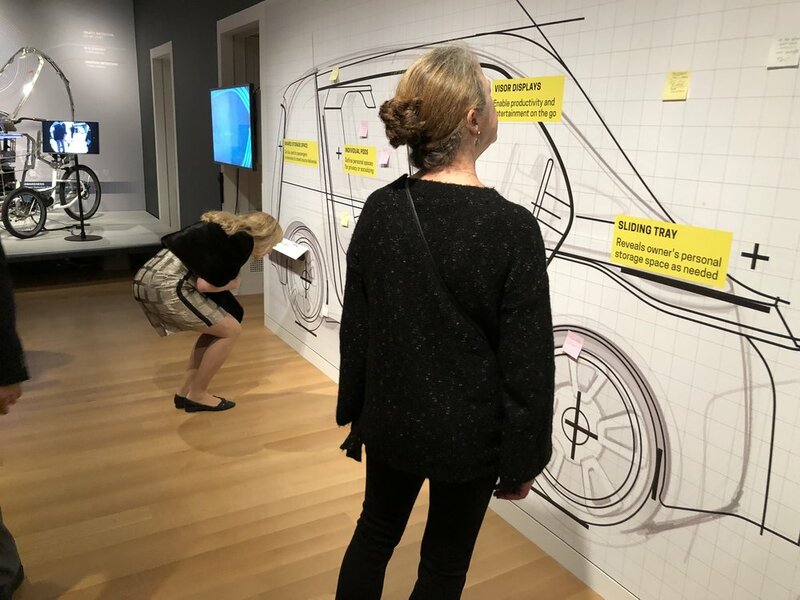 All of this is what IDEO has explored in chapter four of its Future of Automobility point of view. Noise canceling or conversation enhancing technologies contained in seat "halos" could help passengers have easier conversations, enjoy media or opt out for tranquil time. Its an exciting time to consider all the needs one must design for when creating something for the new on-demand and shared mobility market. Providing shared vehicle occupants with a choice of being social or relaxing on their own will be key challenge in vehicle design for the next generation of vehicles. With Connected, Autonomous, Shared and Electric vehicles on the horizon, the gig economy and the sharing economy may well intertwine in interesting new ways. Imagine accessing a shared vehicle for a few hours and paying for that time by running an errand for the vehicle owner. By picking up their groceries and placing them in a cooled storage area, everyone benefits. Mobility is gained and money saved by the vehicle borrower and time is saved for the vehicle owner. Vehicle utilization goes up as well. 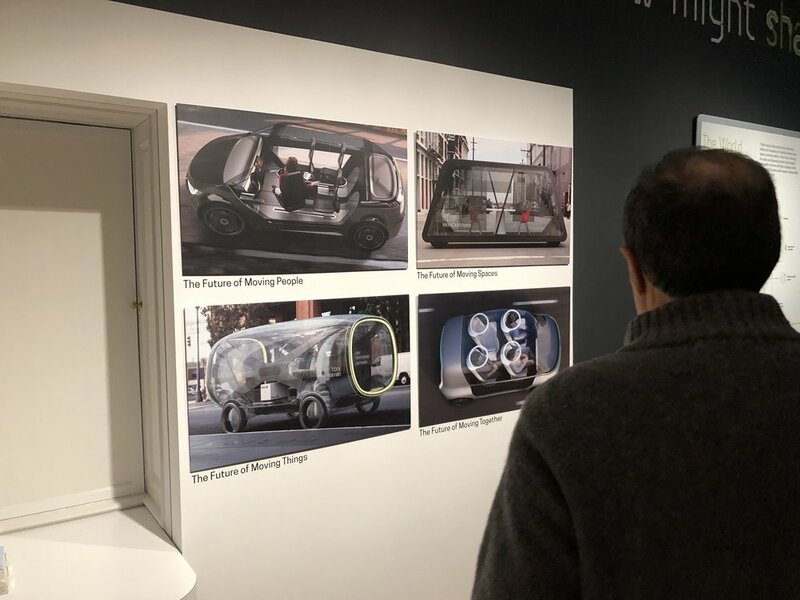 As envisioned in IDEO's Future of Automobility provocation series, accessible heated and cooled storage spaces could enable a range of new on-demand services. Sharing economy...meet the gig economy. A driver using a shared vehicle cuts the cost of their shared vehicle session by running an errand (in this case picking up fresh vegetables for the week and storing them in a cool vehicle storage area) for the vehicle owner. For more see the Moving Together section of IDEO's Future of Automobility provocation. Apparently form can follow function and still be cute as well. Equipped with ADAS features and greater visibility, these electric trucks with a range of around 150 miles should serve London and Paris well. Take a closer look over at Quartz via the link below. There is something very striking about viewing objects in an exploded or x-ray view. One has the sense that you are being invited into a secret world allowing for the way in which an object is made to be readily seen. This "cutaway" mockup of a 2018 Jeep Wrangler Rubicon Unlimited four door model is a nice example of this. It gives viewer a sense of improvements made to the new model. This kind of transparency is interesting to see especially for objects as complicated to manufacture as automobiles. The Cadillac ELRdesign has been getting a lot of attention at the bivouac lately. In addition to the striking design and progressive technologies both inside and out, various small details stand out in a good way as well. Cadillac logo placement within both headlamp and tail light elements is well executed. Each adds an elegant and refreshingly understated, yet dynamic signature touch. That's a tough middle ground to hit. 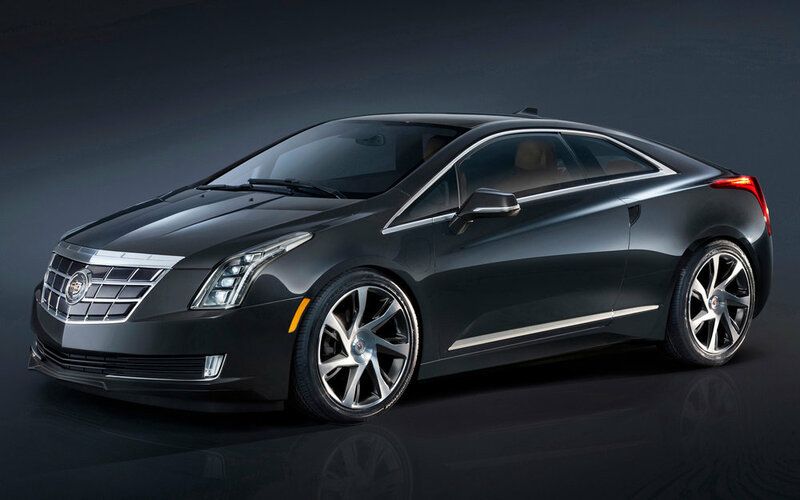 Here's hoping such attention to detail lights the way to forward to continued impressive designs coming out of the Cadillac studio in 2013 and beyond. Lately, my nephews and I have had the opportunity to spend some quality time in Seacrest County, the fictional land featured in Need For Speed Hot Pursuit. Thankfully, designers of this racing game have foregone obsessing over telemetry and torque curves generated on the world's most famous race tracks. Leaving that to those crafting Grand Turismo 5, NFS creators instead made the solid decision to offer up a dynamic new twist on a childhood favorite: Good Guys vs. Bad Guys. Adrenaline levels run high as convincing near photo-realism is placed in just the right places. It starts with the diverse and beautifully rendered vistas of Seacrest County, which span coastal roads, open desert highways and snowcapped alpine routes. These stand out as heros of the title alongside the fastest police response units. Creators of the game follow through with a great range of the world's most exciting vehicles. I for one was most happy to see the BMW Z4 sdrive3.5is and the Lamborghini Reventon among the list of beautiful cars one can try their had at. 1. Support immersion- Convincing visual details in the landscape and vehicle modeling are convincing and invite drivers into the world of Seacrest County. 2. Cause and Effect Loops- Dramatic and sufficiently detailed damage simulation reinforces just enough cause and effect consequences to keep things interesting. 3. Collectibility- An impressive range of vehicles each with their own overview provided by an ecosystem of manufacturers keeps one engaged and moving forward in the game as does the addition of technological enhancements. While there are surely a number of alternative driving games out there with more realism that would be far better to use as training platforms for your next trip to the Nurburgring, few can match the levels of sheer joy that come along with busting bad guys or racing at high speeds across the deserts of Seacrest county. Thanks goes out those who put quality time into creating the vistas of Seacrest County and Need For Speed Hot Pursuit.